Introducing Trevor. He is a bit slow. ← April 7, 2015 – Motivating Giraffe turns 1! I need you in my classroom or at least a pet giraffe. My business partner’s name is Trevor, so….. funny! Gosh, I need to tack this up on my corkboard or something. It’s a really encouraging reminder and an adorable illustration. Trevor has a nice smile. love him. You answered a question I had been meaning to ask! I didn’t think I remembered Giraffe or Pig having a name, and now I know I wasn’t crazy! Whoa this idea was something I was just discussing with my bf, slow and steady but regular incremental improvements win the race! Love this post! 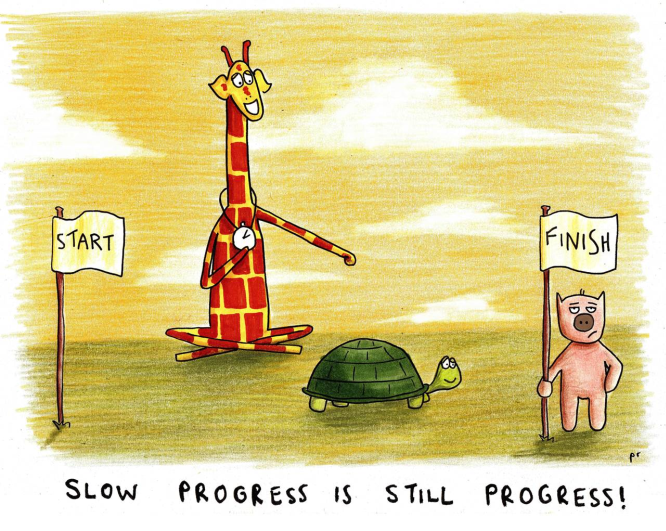 I needed this motivation :D Because I am slow too, like the tortoise, but I know I’m getting closer everyday :) Keep in touch. Is he a turtle or a tortoise? If the latter, he may live past 200 years–in which case, he’s got PLENTY of time to reach that finish line. Haha a tortoise – he’s got time! That is going to be my new life slogan. This is so cute — yes some progress is still progress. Thanks for liking my quilt. Congratulations! you have been nominated for the”very inspiring blogger” award! Go to this link and it will tell you what to do! I need to remember that – I’m so impatient sometimes. Trevor is adorable Penny. Couldn’t agree more! Awesome artwork! Awesome message! sometimes slow progress can also be thorough progress.